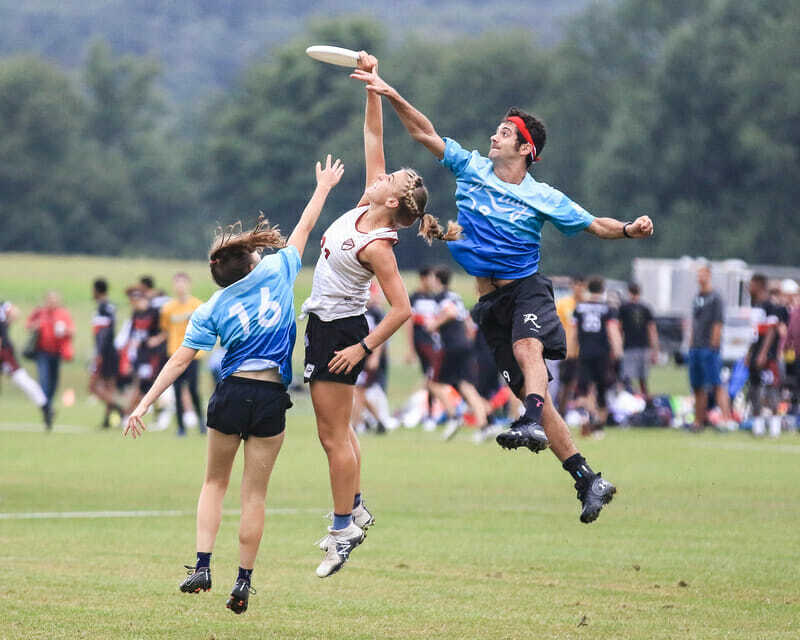 The top five teams in the Mixed Division descended on Middletown, NY, with eyes set on the top overall seed at Nationals. Several lower seeded teams are looking to crash the party and spoil this last tune up before the series. There were upsets across the board and several close contests with plenty still to play for on Sunday. In a rematch of the 2017 National Championship game between #1 Philadelphia AMP and #5 Seattle Mixtape, the teams put on a show that lived up to the billing. A few points after an early break by AMP set up by Spencer DeRoos’s layout block on the centering pass, Mixtape responded with a Khalif El-Salaam sky over Nicky Spiva to get a break of their own. The pair traded in an efficient second half showing. With the game tied a 12-12, Mott gave away the disc on a huck. When Bert Abbott tossed a wide around flick to a seemingly open El-Salaam, Mott sprung into the passing lane and swiped possession right back with a big layout block. AMP managed to hold and, on the next point, pressured Mixtape into a turnover, before Luke Ryan secured a controversial toe-in goal. AMP closed the game out to win 15-13. Each team got impressive performances from their star center handlers. Spiva powered AMP’s explosive deep game in the second half, while Robert Roos was the primary target. Linda Morse also showed off her growing skillset, with some slick downfield work in tandem with Emily Shields. Meanwhile, Mark Burton was the hub of the Mixtape offense, aided by the return of Dom Cavalero. #2 Seattle BFG dropped games to both Drag’N Thrust and No Touching!, finishing their first day 1-2. After winning a World Ultimate Club Championship and reaching the final of the U.S. Open earlier this summer, no one expected BFG to be on the brink of missing the bracket heading into Sunday. But playing without star cutters Rena Kawabata and Kieran Kelly proved a task they simply weren’t able to overcome. While the first loss was a bit surprising, the second was stunning. A 15-13 loss to Drag’N in the second round of pool play was in no small part due to Sarah Meckstroth, one of the division’s elite talents, who tallied two goals and two assists. But BFG played an ugly game against No Touching! that was hard capped well short of the point cap. They were torched by Justin Simanson for nine assists on the way to the 11-9 victory for the Minnesota team. New York XIST is one of the few unranked teams at the tournament, but the no. 8 seed is in a strong position after their performance on day one. A few points here or there could have made them undefeated, or conversely, winless. The total margin of victory of all three of their games was four goals. But led by Ryan Drost’s 10 goals on the day, XIST managed a surprising 2-1 record. The day didn’t start off great. XIST went down 3-0 to nothing Drag’N Thrust, and still trailed by three at halftime. A three-goal run in the second half gave them a brief lead, but they couldn’t maintain it. They fell in cap, 14-12. While both of their games against No Touching! and Metro North were won by a single goal, only their game against the Minnesotans went to double game point. A second half run against Metro North earned XIST the advantage, and Metro North’s final score was already in cap. Keeping with the theme, the New York club picked it up in the second half against No Touching!, but they saved it for the final moments. They scored three straight to come back from down 12-10 to win 13-12. Boston Slow White struggled on Saturday with losses to Boston Wild Card and Philadelphia AMP. Slow went down early against Wild Card 5-1 before closing it down to just a one-point game at half. The two spent most of the second half trading holds with Wild Card eventually winning 14-12. Against AMP, Slow White played much closer than in its previous matchup at U.S. Open. Boston is still looking to reclaim its form from WUCC. The other Boston mixed team in attendance won the crosstown matchup over Slow White and handled Rally before falling on double-game point to Seattle Mixtape 14-13. A win Sunday against AMP by more than two would lock up the pool for Wild Card. It would be a tough ask, but it’s not impossible after looking strong on Saturday. First round games in the mixed division are crucial for everyone involved. AMP faces off with Wild Card while Slow White takes on Mixtape in Pool A. In Pool B, BFG plays XIST and the two Minnesota teams show down in No Touching! and Drag’N Thrust. Both pools are up for grabs and could come down to some tiebreakers to determine who moves on. Comments on "Pro Championships 2018: Day One Recap (Mixed)"